The energy transition has arrived. After years of merely talking about change, there is now significant acceleration in the transition from a high-carbon to a low-carbon energy system. The increasing competitiveness of wind and solar are now massively shifting the investment in power generation towards these renewable technologies in developed and developing countries alike. Energy efficiency is finally getting the attention it deserves, with smart technologies making energy more flexible and productive. And in the world of personal mobility, recent announcements from one automotive manufacturer after another indicate clearly that the future of transport is electric. All this should give us hope, but we must move even faster. Global carbon emissions have risen by more than 2.5% in 2018, making it difficult to achieve the Paris Agreement’s goal of limiting temperature rise to 2°C. A rise of even 1.5°C will create terrible risks. There is still a lot of hard work ahead of us. At the recent meeting of the World Economic Forum’s Global Future Council on Energy in Dubai, we discussed some of the major opportunities and challenges of the years ahead, and what the Council can do to help. Technological innovation: Solar and wind power, battery technology, smart grid technologies and energy efficiency are improving rapidly, and new technologies are getting better and cheaper. Dropping costs: Innovation is leading to lower costs. In many places, building new renewable power sources is, or will soon be, cheaper than keeping existing fossil fuel-based power sources running. The cost of digital solutions that can make smart use of these energy technologies is dropping, and passenger electric vehicles with useful ranges will soon cost less to buy than cars powered by internal combustion engines. Global spread: The widespread deployment of clean-energy technologies has grown beyond a few developed countries. Breakthroughs are being pioneered in Silicon Valley and Berlin, but innovation and large-scale deployment is also happening in Shanghai and Mumbai. In 2017, renewable energy received more than 60% of global power generation investment. Emerging alignment: The momentum for a transition to a low-carbon future has taken hold among cities and states, as well as among investors, businesses and civil societies. The recent climate summit in Katowice showed that the global coalition is holding firm. This alignment is creating more clarity about the future in one boardroom after another, even in countries where government policy is not leading the way..
More than the sum of its parts: New energy technologies are reinforcing each other. Ever-cheaper batteries developed for electric cars are bringing storage within reach for electricity grids. Information technology is helping support an ever-greater share of variable wind and solar energy on the grid. Integrated portfolios of wind, solar, batteries and demand management can do all the things that large central fossil-fuel power plants can, and for less money. The result is cleaner energy across the global economy. But while we can be optimistic about our cleaner electricity system and electric cars, other sectors of the economy still lag in their transition towards low carbon. We face challenges in reducing carbon emissions from sectors such as aviation, shipping, trucking, heavy industry and high-intensity heat. 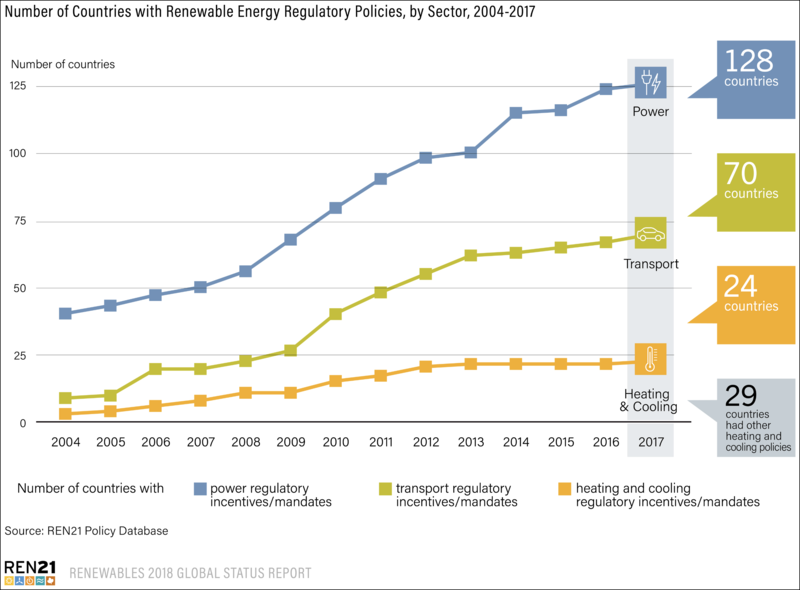 But decarbonizing these sectors is both doable and affordable, as a recent report by the Energy Transitions Commission shows. The report estimates that cost to move these sectors to low carbon will amount to less than 1% of GDP with today’s technology, and innovation will make it even cheaper. It will take collaboration between governments, industries and consumers to succeed, however. The keys to this are reducing energy demand, improving energy efficiency and using decarbonization technologies. Critically, converting the overall energy economy from high carbon to low carbon will be simpler and cheaper if the energy economy is smaller to start with. Over the past seven years, the pace of energy productivity improvements has almost doubled. But it needs to improve faster yet by adopting efficient technologies and by designing products, processes and service-economy business models that can reduce the quantity of materials and energy required in the first place. A recent analysis found that the combination of technical efficiency gains and the shift from products to services could reduce total final energy demand by 40% below today’s total by 2050 while sustaining improvements in the global standard of living. This would enable the world to limit warming to 1.5°C without the use of negative emissions technologies. First, we must shift large-scale investment from high to low-carbon assets, address the challenges of no-longer economic high-carbon assets, and help finance the energy transition in developing economies. “Stranded assets” will be an unfortunate byproduct of a speedy transition, but more rapid capital turnover can be achieved through clear-eyed public and private collaboration. Second, we must spread clean energy access to the more than 1 billion people without reliable electricity. To do this, regulators need to take a holistic approach to reliable and clean electrification by clarifying and valuing the role of off-grid solutions, strengthening local utility performance and finances, leveraging efficiency and distributed energy solutions to improve system reliability, and improving the flow of finance by managing key risks. With increased recognition, ambition, and proof points in these and other areas, the tide has turned and momentum is growing. Continued aggressive action from all stakeholders will speed the energy transition. Global and local, public and private institutions must redouble their efforts to build new markets that fully realize the potential of new technologies. Capital providers must recognize and act on the greatest investment opportunity of the century: the clean energy revolution. Communities can drive and shape the transition to fit their local context. Together, we can seize the opportunity for a net-zero energy future.